Before we left for Costa Rica, I added to my digital gear a Nikon D300. It is all it is said to be. A great improvement over the D200 though the D200 is still an excellent digital camera. I have made many great images with the D200 and was planning to keep it for a second body. I’ll tell you why I didn’t in another post. We were fortunate to find a festiva in the town of Samara before our “In The Rhythm™” tour began. Samara is one of our favorite small towns to hang out in. Anyway, during festiva there is usually a horse parade, high steppers, with winning ribbons and trophies. After the parade they have a bull riding contest. Lots of fun and great photo opportunities. The bull riding is not like anything you’ve seen before. The local macho men get into the ring and when the ride is over, antagonize the bull. Naturally, when the bull chases them, the macho men head for the safety of the fence. What a blast! 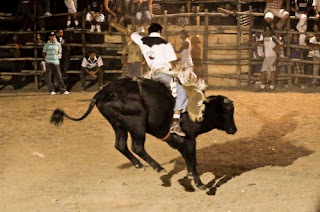 The bull usually gets the best of them and eventually is lassoed by a caballero and led back to the pen.